Out of the 400 kids currently under our training program, 23 kids under 15 were chosen to create 2 teams: 1 male and 1 female. It was afternoon of February 20th when we met-up with the kids to start our journey. A lot of them were excited, they have never travelled out of their city. 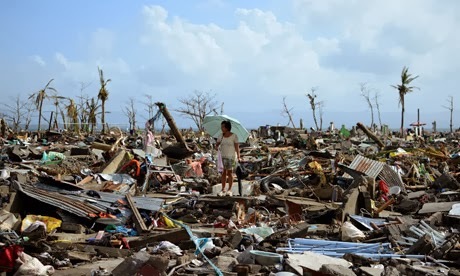 Typhoon Haiyan was the worst typhoon in history and Tacloban City was left to rubbles. Communities lost everything and for people from marginalised communities it seemed like hope was lost. Months passed since the tragedy happened but up until now people are still rebuilding. While most NGOs and government units are busy rebuilding physical structures, Fundlife International is busy rebuilding lost dreams. 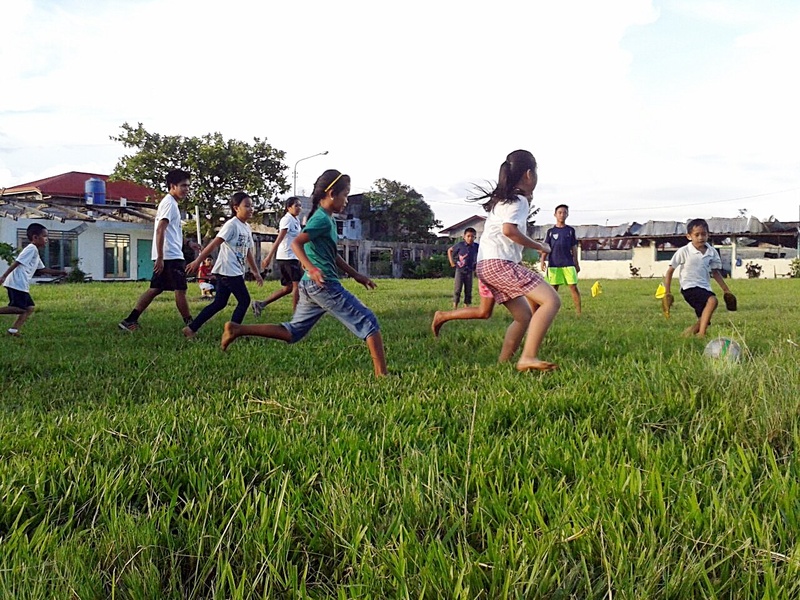 Half of Tacloban’s population are youth and to deal with such a traumatic incident, with the Football for Life Project we try to introduce play therapy for psychosocial support as well as to challenge them to work for their dreams. 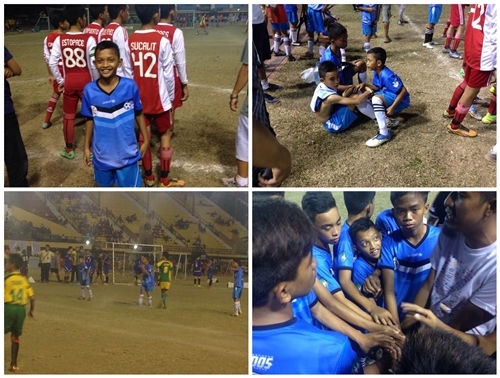 It was around January when we knew about Thirsty Cup, it is an annual football competition in Cebu City and we knew it was the right motivation for the children to show what they were made of. Out of the 400 kids currently under our training program, 23 kids under 15 were chosen to create 2 teams: 1 male and 1 female. It was afternoon of February 20th when we met-up with the kids to start our journey. A lot of them were excited, they have never travelled out of their city. Cebu City was one of the big cities in the Philippines and for them it was a dream to go on a ferry boat. It was a 7 hour trip and the boat left by 10p.m. but instead of sleeping early, the kids were so pumped up that they did not sleep until 11a.m. While hanging out with them, I started hearing their stories. For some it was already a big opportunity to compete in another city. Hearing their story of their first travel also took me back to my childhood. I also grew up from a simple family who was always trying to make ends meet. I remember the happiness I felt being on the boat and it was the same thing I saw with the kids. I chatted with them until all of them fell asleep. 4a.m and I woke up to the sound of the stewardess announcing the arrival of the boat in the port of Cebu and I looked at the foot of my bed and there were several girls trying to take a peek on what Cebu looked like. They kept on asking when we would go to the hostel where they would sleep. The moment they got off the boat they started seeing how bigger the city was and two of the boys even decided to sit in front of the jeepney. As we arrived in the lobby, they gathered around the vending machine. They have never seen such contraption and they asked me to show to them how it works. When we got their room assignment all the kids rushed into the elevator, leaving some of them behind. I told ones left that we should just take the stairs but one little girl looked up to me and said, “Coach it’s my first time taking an elevator.” I just couldn’t deny her of it and so we waited. After hours of preparing they headed onto the stadium where they met the other teams. Most of them were double their size and yet they did not let it scare them. The boys just lent their shin guards to the girls while both our goal keepers did not have any gloves and still they managed to give a great performance. They never backed down eventhough they went up against more trained players. The Pintados FC, our boys’ team, went up against three of the best teams but they managed to keep the score of their enemies to 1. 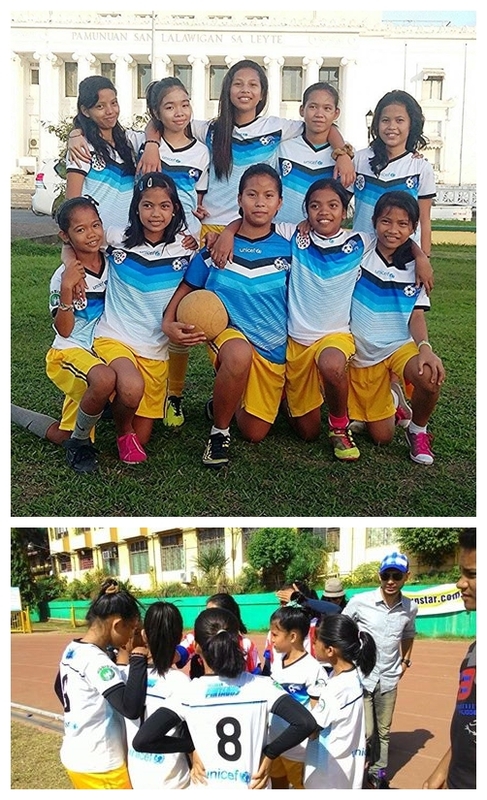 While the Pintadas, managed to have 2 draws and a goal that secured their spot in the semis. It was so inspiring to see both teams which were formed in just a month who trained together in just a couple of weeks with barely any equipment, accomplished so much. As we embarked on the boat back to Tacloban, they were all smiles and stories of how they made it through their first competition and for them it was just a new beginning. They were already asking me when the next training will be. The first taste of victory made them see that they can do more than just wait for people to help them. Most of the time, we grown-ups do not realise how lucky we are to have certain things and opportunities. These kids made me appreciate a lot of things on the course of our trip, even just having a pair of socks where some of the kids did not even own a pair. To be reminded to not back down from our dreams just because the world seems to big to conquer. These little football players scored their first victory not only on field, but against inequality. From being mere victims of calamity, these young survivors are on their way to being champions of their own lives. Get more updates on about them here. Crazy how years pass by so easily, today I turned 28. I normally avoid celebrating my birthday but my mom keeps on reminding me to. She says that it is a blessing, a special day worth enjoying. A couple of days ago, I went back to my hometown visit Lake Danao, though I originally planned on going to Sagada for my birthday. There were a lot of things that did not go well. It was raining on and off, hours waiting for my friend, walking around to find the jeepney, waiting for hours before we left Ormoc City, missing the last trip back to Tacloban, getting stranded in Ormoc and to top it off losing my mobile phone and ATM card along the fields while waiting for a ride . It was a series of unfortunate events yet I managed to tick off several things in my bucketlist: top load on the jeepney, hitchhike from Dolores back to the city proper and stay with an awesome local family. In the end, the whole journey made me content and happy. The trip is a lot like life. We do not have full control of everything but in general life is still beautiful. You just need to turn away from the negativity and see things like a child. Blessed with the freedom to steer my life into the direction I wanted, good people who are there for me despite my shortcomings and unthinkable opportunities that turned me into changemaker not just a dreamer (Fundlife). I am grateful to my parents for bringing me into the world. Though I still find it difficult to see reason in celebrating my birthday, I have lots of reasons to celebrate life. 27 chances and counting, I choose to make things right and make the most out of my life.